Its been a while since ive been on here.. things have gotten real busy… we had our Pins and Pine Needles quilt guild bi annual quilt show and i was busy trying to get all my projects done. So a bit of history why I choose Hayden… as my 1st collage…She is my son dog. Brett adopted Hayden from a rescue society.. she is his baby and he even had her tattooed on his arm. His adoptive mom is a quilter so I did not want to give him a quilt. When I looked at the picture he took at Christmas I saw that it would be easy to break down the colors into light medium and dark. Now it was time to start so I down loaded Gimp photo editing program so that I could turn Hayden’s picture to gray-scale then posteurize it to 5 shades. Then print it out to a 8×10 sheet.. then I traced the picture onto onion or tracing paper and enlarged that to 4 sheets this game me a 16×20 size. enlargement to 4 sheets and i colored in the darkes to make things easier for me. Next was to sort my fabrics.. when I did this separated all the fabrics that I planed to use into piles from light to dark then took pictures and turned them to gray-scale also. This gave me a truer color separation. There were many sets of photos taken to get to the final result. Next I traced Hayden onto a foundation fabric so that I could start building her the whole time that i was making him I had the original picture, the gray-scale picture so keep referring back to. I used tacky glue to hold my peiced to the foundation fabric. Here is Hayden as she was being built. I tested backgrounds and ended up liking the blue one best thought she looked like she was floating so I added in the black to make it look like she was siting on a photo studio table. Testing blue backgfound this is the winner. Next step was to glue her onto the fabric and then I added tulle over her so hold down all the pieces and quilted her. 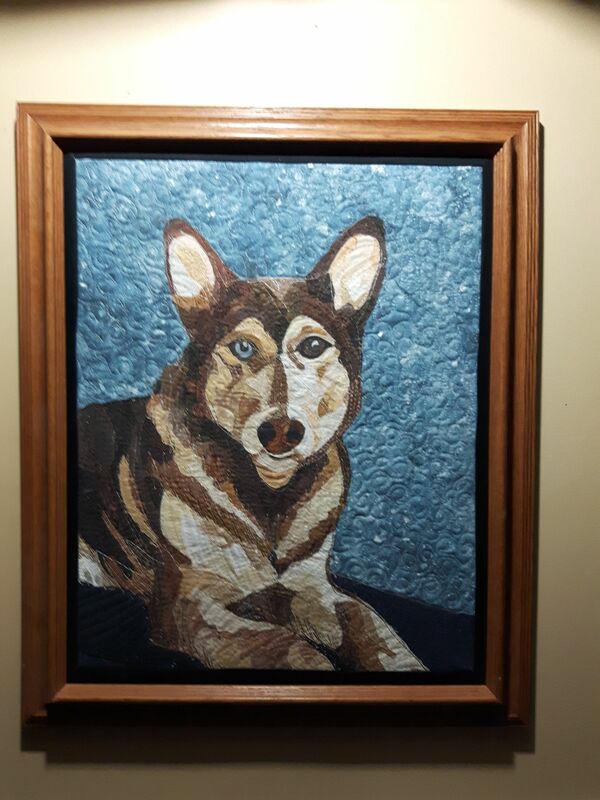 I framed her and displayed her in our quilt show. Brett will receive her next weekend. Previous Dino Bubbles…Setting in Circles.